Use this tip for healthy & happy plants when you’re on vacation. Instead of relaxing at the ocean and really enjoying your vacation is your mind back home worrying about the plants that depend on you for water? For some of us, plants have been around for generations. Losing Grandma’s 10-foot-tall fern would be devastating. I’ve had those same vacation jitters. That’s why I’ve come up with a couple of ways to keep your plants green and healthy for days. One way is to make sure they're in a cool environment so as to not evaporate the water the plant needs faster than it can soak it in. You don’t need a green thumb to know that hydrating is key, but if you're on vacation you can't be around to water and simply keeping them cool will still leave most types of plants thirsty. So what do you do? Allow me to go step-by-step through a plan that will help your plants avoid dehydration. If you do not have these specific items, feel free to substitute with things on hand that fit the purpose. With our tools in place, let’s get to work. 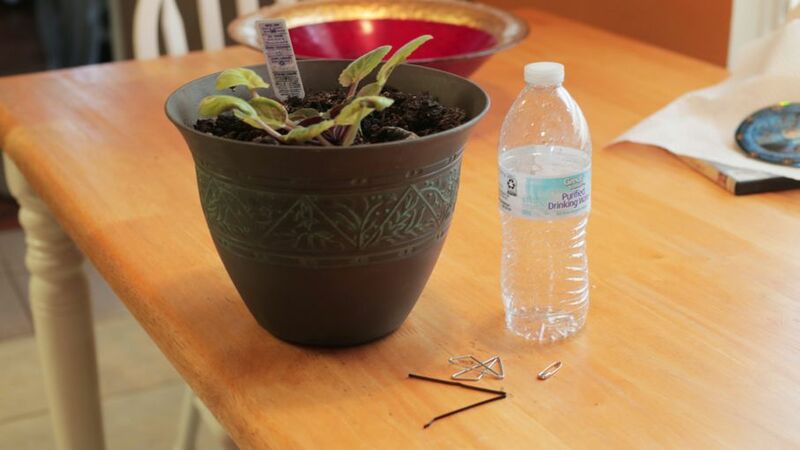 Before leaving on your trip, give your plant a healthy dose of water as you would normally. Then tackle the following steps. That way, your plants can be preserved longer since the water you'll be giving your plant will be stopped by the mud until it dries a little. First on your to-do list is to fill up your bottle with cool or room-temperature water. Don't put the cap back on since we'll be using it by itself later. Make sure to test your water so that the temperature isn't too hot or too cold. Otherwise, you may end up damaging your plant's roots. The cap serves the purpose of stopping all the water from pouring out of the bottle at once, which would happen if there was no cap. It’s important to create holes the right size to ensure the right water flow. 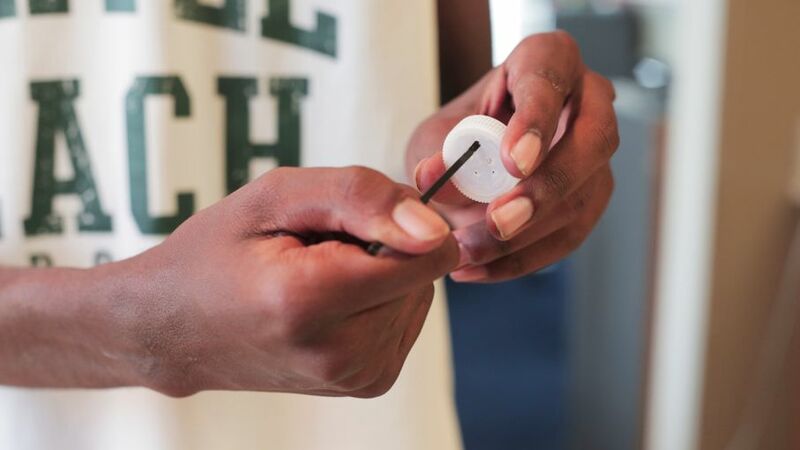 Take your smallest puncturing tool and the bottle cap in hand. To be safe, make sure your fingers are not behind the area your paperclip will come through. Next, poke various small holes into the cap. Somewhere between six to 10 holes is best when using smaller holes. After making the holes, you can screw the cap back onto the bottle. Flip the bottle upside down and check if there’s enough water flow. If you think this flow won’t do the job, take the medium-sized puncturing tool and insert it into the holes you made earlier. Again, if the water isn't flowing well, you'll have to take out the big guns. 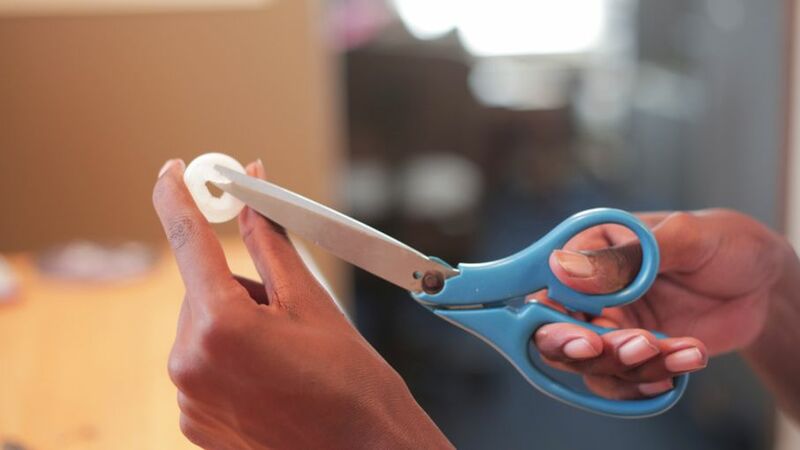 Insert your scissors or puncturing tool of similar size into one of the enlarged holes. 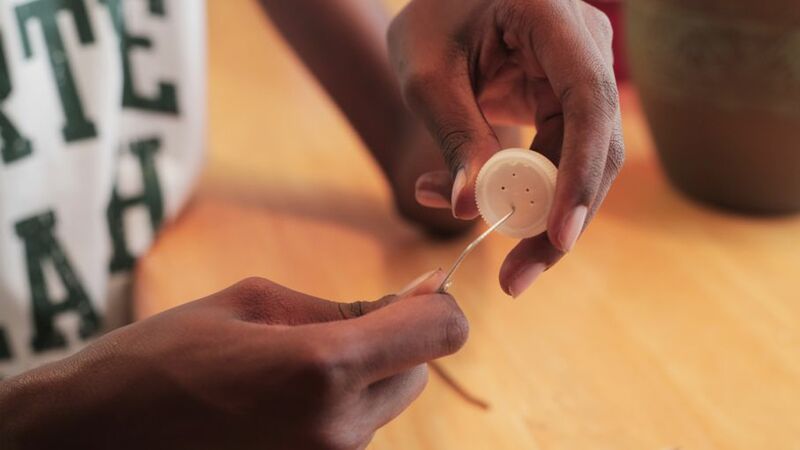 Then cut a single, carefully sized hole in the middle of the cap. Be mindful that if the hole is too big, there won't be a point to the cap. The water flow should just right. Now we're ready for the plant, or rather, its soil. 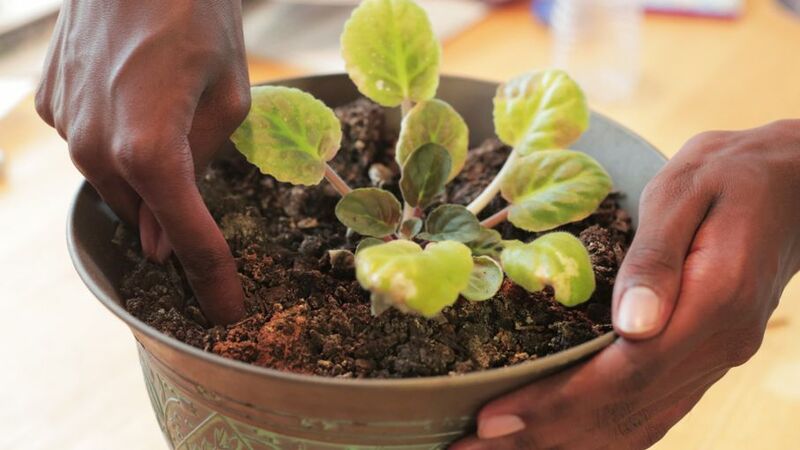 Take one of your fingers and dig a hole about ½ to ¾ inches deep next to the plant's stalk. Don't be too rough or else you'll rupture its roots. Place the cap back onto the filled water bottle and put the bottle into the hole. Be sure to insert the bottle at a slight angle with the hole. This is important because you don't want to have the dirt or mud dam the water. Putting the bottle at an angle will let a little air displace the water in the bottle, allowing the water to flow out. You now have a watering system that will keep your plants hydrated for longer stretches of time. As long as the drip feed continues to work and your house is moderately cooled, you can take a trip without the worry of returning to an early fall season, if you get my point. 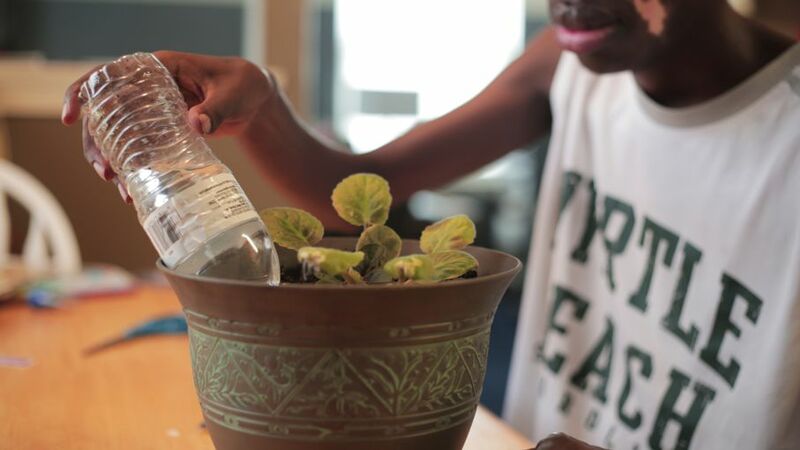 With this project, you can travel and come home to healthy plants.